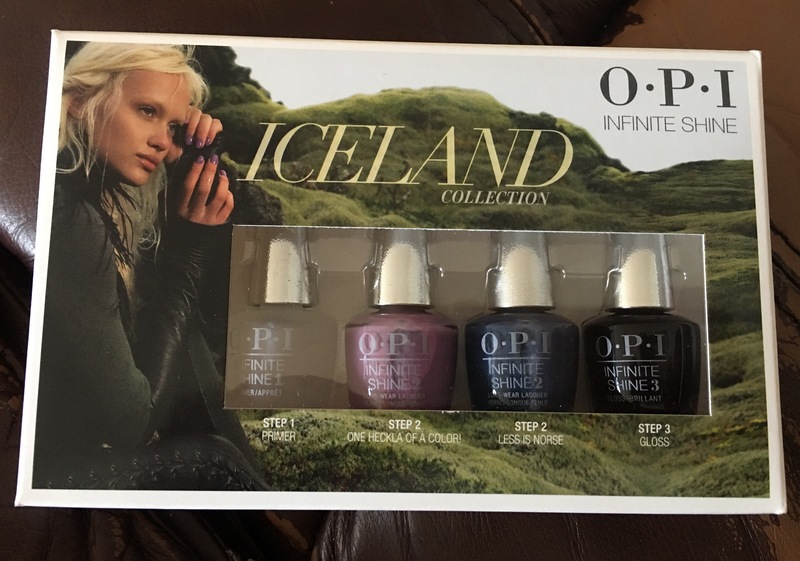 In preparation for my return to Iceland, two things were necessary: ensuring I had the right gear, and making sure my nails were painted in O.P.I.’s new fall Iceland colors. After a stop at Ulta for my beauty supplies, I could focus on my gear. I ransacked Alan’s and my closets for all our summer rain gear and fall camping gear. Temps are expected to be in the 50s with lows in the 40s. I learned last winter durable weatherproof clothes is key in Iceland. Your biggest concern is Mother Nature. I also grabbed my zero degrees sleeping bag. I’ve never taken a sleeping bag on a flight before. The five hour time change in Iceland can be challenging to adjust to for a non-morning person like myself. I may need a roadside nap or two. It would also come in handy if I am unable to reserve a hotel for any of my nights. As of this morning, I had only booked my first night’s accommodations. I’m usually the over-planner type, but this trip I wanted to go at my own pace. Alan talked me out of my “wing it” plan today and I am glad he did. After some research, I learned there were only two rooms left in two of the towns I planned on staying at. Of course I checked multiple booking sights and made another call to my travel agent. But two rooms left available on a Sunday and Monday night seemed the reality, and they came at premium prices. One of those nights I am planning for is in Hofn, the town near the most popular national park and glacier lagoon. These were top of my list of things I missed last trip and I wasn’t about to miss them again. The other night I was looking to spend in Vik, the southernmost town in Iceland and home to one of the best burgers I’ve ever had. After this startling revelation, I started researching and booking my intended stops after packing, and then finished my bookings at the airport. Alan is happy knowing I have a confirmed check point each night. I’m happy knowing one of my biggest hiking days will have a warm shower and bed after it. Today is my first time flying a budget airline. The price was hard to resist. 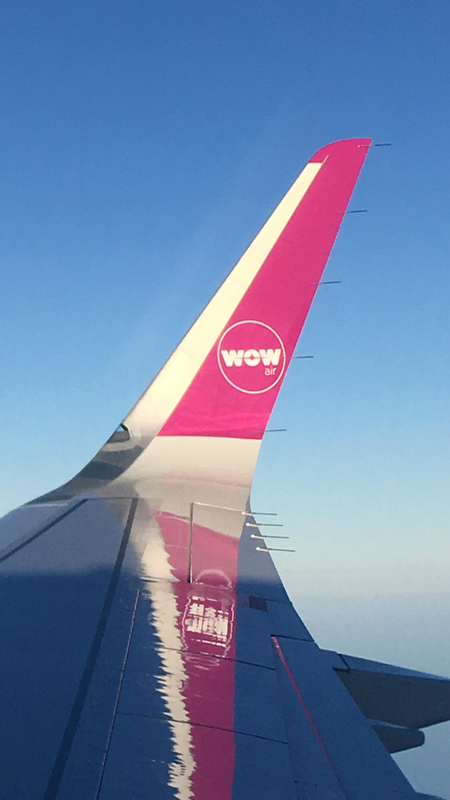 I booked a direct flight on WOW airlines via Kayak. 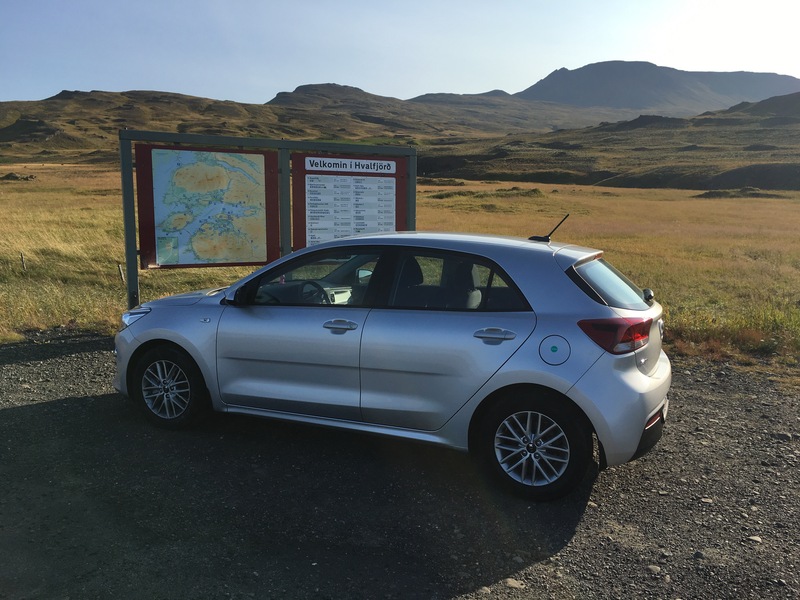 I had reached out to the travel agent who planned my last trip to Iceland, but they were getting rates almost double what I was seeing. I was feeling confident about my budget choice until I saw the price to merely request a certain type of seat. Just to suggest you wanted a certain kind of seat would cost $25 round trip. The cost for luggage was also steeper than I hoped. With the sleeping bag, stuff sack, and extra hiking shoes, I knew I’d need to check a bag. I’m pretty accustomed to these features being included on international flights, yet the new round trip total was still less than the price on a more traditional airline, so I proceeded in purchasing the ticket. Now that the day of the flight was upon me, I vented to Alan about how it’s worth an extra $150 for a flight if it includes your $120 checked bag, unknown cost of pillow and blanket, and refreshments. Especially since many international flights these days also include free wine or beer. He reminded me that my flight was direct to Reykjavik from Chicago. He was right, there’s something be said for direct international flights. For my first trip, I had to fly to Boston on a domestic airline, collect my bag, recheck my bags on my international airline, and go through security again, to reach Iceland. It’ll be nice to skip all that this time. I checked in for my flight online and was disappointed I did not get my TSA PreCheck nor a free checked bag. My friend who flew WOW the month prior received by using an online agent. I was starting to feel icky and unsettled about my upcoming flight again. Upon arrival at the airport I was pleasantly surprised. There was only one person in front of me for baggage check and I was not charged for my bag. The whole transaction transpired so smoothly, I didn’t event realize my fortune until I was sipping a margarita the terminal. TSA security went smoothly and I had no wait and a free checked bag with the airline! Wow! (Pun intended). I also was assigned a window seat, my preferred seating, without needing to pay for it. It seemed the Icelandic elves were blessing this trip. 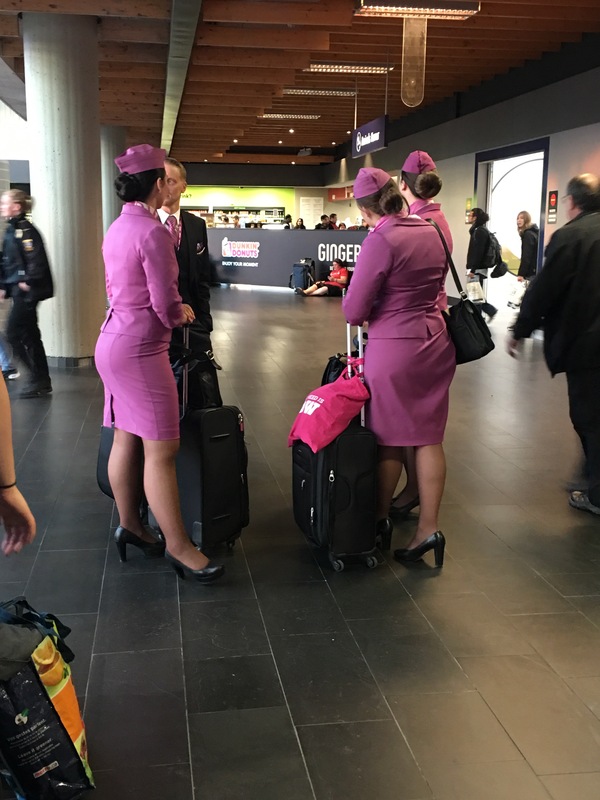 I was also amused to see the WOW flight crew wearing classic styled purple uniforms. Once onboard my flight, I was seated next to two young ladies in their 20s. The girl sitting in the aisle returned to her seat shortly after I arrived at mine and not seeing me there said to her friend, “The bathroom smells better!” In a lighthearted tone. We all busted up laughing. The cabin didn’t smell bad, but I can see how the restroom air freshener would be more pleasant. It was a great icebreaker and we all began chatting. It was the girl’s first trip to Iceland and when they saw me bust out my eye mask, they asked if they should try sleeping on the flight. I informed them of some of the challenges I and some friends have faced when they arrive in Iceland. In short, the first day can be rough and you should sleep as much as possible on the flight. We also talked about some of the sights they will be seeing. They thanked me for the advice and started talking about their recent trip to New Buffalo, MI. What a coincidence! New Buffalo is where I will be in two weeks for my friend’s bachelorette. Upon arrival I found some sandwiches, a SIM card, and duty free beer for my trip. Grocery stores don’t open till 11a in Iceland, and I wanted to be sure I wouldn’t starve during my busy day. I found everything I was looking for, grabbed my luggage and waited for the shuttle to grab my car. Once I signed away my first born child to the vehicle liability gods, and said “go pack” to a fellow packer backer, the car was mine. I squealed like a teenage girl and set off for the highway. Iceland awaits. FYI, WOW is not the only airline flying nonstop ORD to KEF. Icelandair does as well. Cheers and good luck with this. Thank you! You are correct, Iceland Air does fly direct from Chicago. I will check them out next time as they did not come up in my, or my travel agent’s searches this trip.